An imam of an east London mosque, Usama Hasan, received a death threat for arguing in support of human evolution two years ago. On Saturday, London played host to a riveting intrafaith dialogue on Islam's stance on the theory of evolution. The east London imam was one of the speakers – but this time there were others who shared his viewpoint. 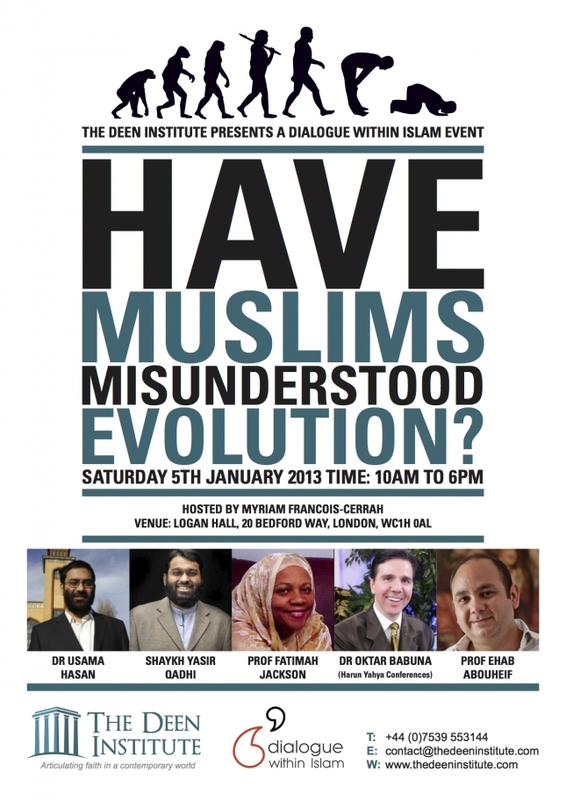 The event, organised by the Deen Institute, was titled Have Muslims Misunderstood Evolution? The speakers included an evolutionary biologist, a biological anthropologist, two theologians and a bona fide creationist. It lasted seven hours, yet almost everyone stayed till the end. There were more than 850 people in the audience and even though the topic was sensitive and controversial, there was no heckling or disruption. At least from my limited interactions, it seemed that the audience was comprised mostly of young professionals. Most had no strong opinion, but their interest was evident as they were willing to spend their entire Saturday hearing about Muslim positions on evolution. Babuna aside, this was a serious debate on an important topic. The rejection of evolution in the face of scientific consensus stands as a Galileo moment for Islam. However, the tone of the debate and the quality of intellectual exchange at the London event is encouraging and it shows modern Muslims have the maturity to address a perceived challenge from a scientific idea. More than 850 delegates flocked to a seminal conference in London on Saturday about the compatibility of modern evolutionary theory and Islamic theology – despite scaremongering and the refusal of Islamic student societies to participate. Determined organisers had overcome pressure to cancel by changing the venue from Imperial College to Logan Hall at the University of London. The event was the brainchild of the Deen Institute, which runs courses to promote critical thinking among Muslim students and kindle rational dialogue within Islam. The need for dialogue is urgent, because to date there has been little open discussion within British Muslim communities on this divisive subject. Recent debates in the US suggest that evolution is not as much of a problem theologically to Muslims as it is to Christian creationists, but there is work to be done to clarify the situation. It's good that this piece appears in the Guardian, and especially online. Now, you don't just have to take my word for it that theistic evolution is unacceptable to mainstream evolution and irreconcilable with atheistic evolution. "Surely the real breakthrough will when Islam or any religion for that matter not only admits to evolution but admits that it invalidates claims that their books are inerrant. Islam: God made Adam and Eve from lumps of clay. Christianity: Waived his wand for Adam then made Eve from him. And interpretation won't work saying that lumps of clay or wand waiving were very smart analogies for evolution because evolution and genetics has shown there was no Adam and Eve. Quite frankly if nothing else, Allah and God were the worst analogy inspirers ever. You couldn't come up with worse analogies or poetic versions of our origins then the Holy Books if your life depended on it. I for one, could never worship a deity who was that rubbish at analogies. I don't care if he could walk on water or send flying horses to pick up his mates. These party tricks don't make up for dumb-assed analogising. The first duty of any omnipotent being is to blow your mind with analogies that make you go "Oh yes!! !, that really works"
If I was an imam or a bishop I'd be quite resentful of the entirely unnecessary centuries of playing Theological Twister they've had to engage in as a damage limitation exercise for God's crap analogies." "Actually (theistic evolution) sounds to me dafter than straightforward creationism. What would have been the point?" Well, when religious views of the world's creation run up against science, all the religious can do is bend as far as necessary to accommodate the science while still maximising the role of God. And when the resulting theory seems to make little or no sense, as here, they just say "He moves in mysterious ways", to avoid the need for it to make any sense to us. In this way religion will shrink and shrink, but never die." These are the people who Mr Hameed sees as allies, whilst mocking his fellow Muslims.